Michael Shurtleff has been casting director for Broadway shows like "Chicago" and "Becket" and for films like "The Graduate" and "Jesus Christ Superstar." His legendary course on auditioning has launched hundreds of successful careers. Now in this book he tells the all-important HOW for all aspiring actors, from the beginning student of acting to the proven talent trying out for that chance-in-a-million role! 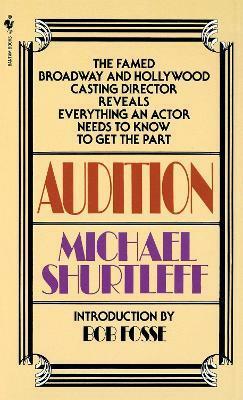 Michael Shurtleff has been casting director for Broadway shows like "Chicago and "Becket and for films like "The Graduate and "Jesus Christ Superstar. His legendary course on auditioning has launched hundreds of successful careers. Now in this book he tells the all-important HOW for all aspiring actors, from the beginning student of acting to the proven talent trying out for that chance-in-a-million role! Besides working as a casting director with Joshua Logan, Bob Fosse, Tom O'Horgan, Mike Nichols, Jerome Robbins, Gower Champion, Stuart Ostrow, David Merrick, and others, Michael Shurtleff still finds time to write plays and novels, direct films, teach his famous auditioning course, and regularly see at least a dozen plays and films every week. He does as he advises his readers: "Everyday learn. Learn enough so you can do good theater."